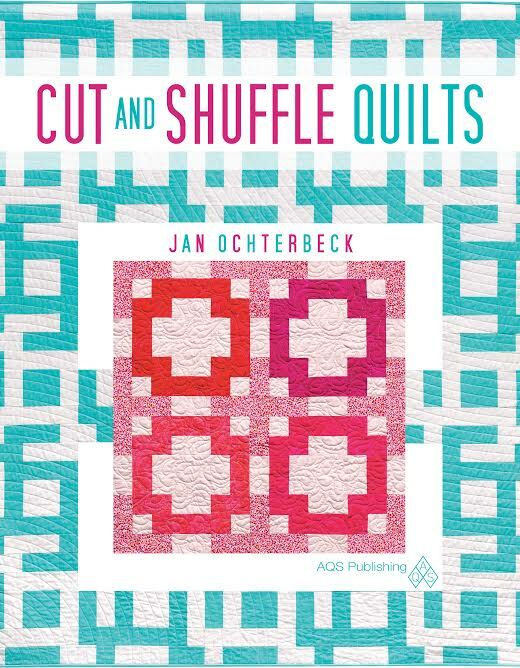 I am thrilled to get to share with you about Jan Ochterbeck @The Colorful Fabriholic‘s recent AQS publication, Cut and Shuffle Quilts (available for purchase from AQS and Amazon *not affiliate links*). 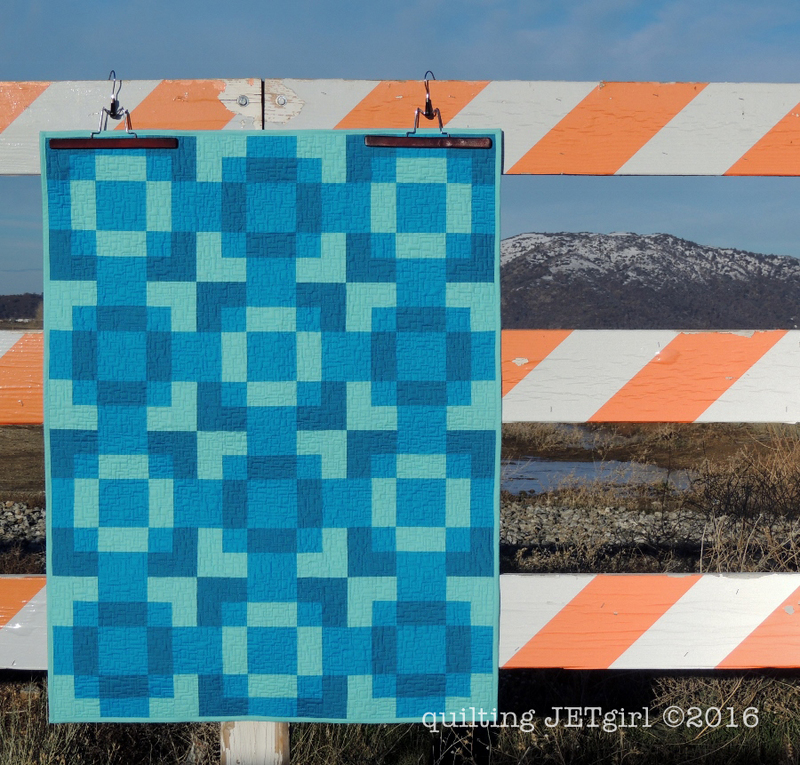 I met Jan in May 2014 as part of the 2014 New Quilt Bloggers Blog Hop, and I have enjoyed continuing to get to know her through her blog. When she reached out to me to see if I would review her book, I enthusiastically agreed, and today I get to share with you my finished version of her Alternate Four Corners quilt. Cut and Shuffle packs a lot into a deceptively thin book. The method is ingenious: Jan starts with a block she called the “block mama” which is then cut apart and re-arranged to create 4 different quilt designs (Jan has also recently demonstrated a 5th configuration on her blog!). The book offers multiple color stories for each quilt design, and I was concerned that I would have a hard time picking out a version and deciding on a color scheme when so many had already been presented. However, when I saw the Alternate Four Corners design, I knew immediately that I could have some fun playing with transparency! I shopped my stash for this quilt. 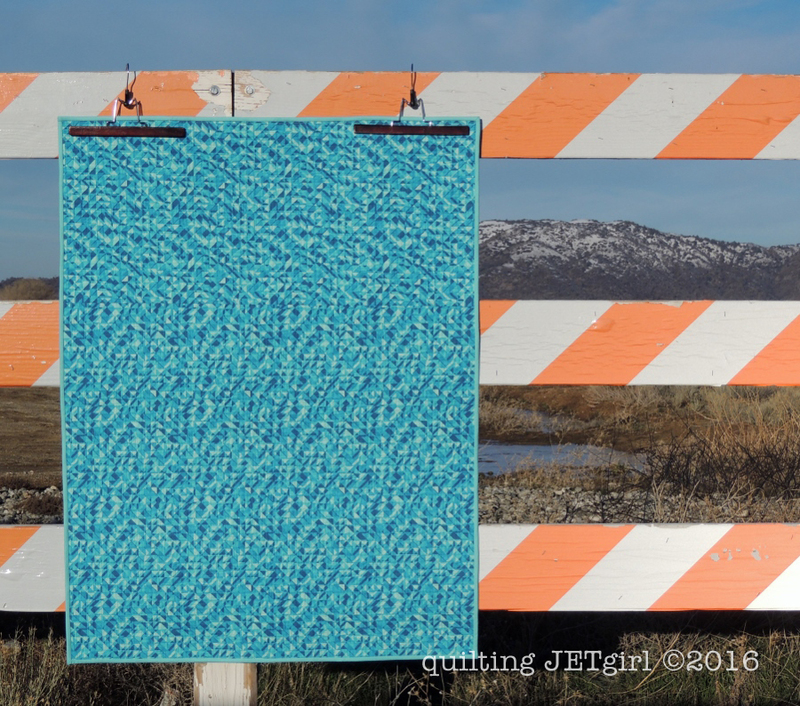 If it seems a bit familiar, it is because I was able to use up left over fabric from Red Herring (Kona Bahama Blue and Kona Oasis) along with a 1 yard cut of Kona Turquoise that I had on hand. Even the backing is left over from Red Herring; I pieced bits of the left over StudioE Prisms fabric. I had a blast working on this quilt. The blocks come together quickly and look like they are far more complex than they are in reality. The method is very clever, the instructions are clear, and I enjoyed getting to put my own touch on the design with the transparency color play. I used a combination of Aurifil 1125 (in the bobbin) and 1320 (on top) for the quilting. I pondered whether to go with an all over design or if I wanted to quilt each color separately. In the end, practicality won out (I kind of dreaded all the thread stops and starts) and I was able to get the quilting done in just a few hours, even though it is quite dense. I used Kona Bahama Blue for the binding (it was the only fabric I had enough left to make a full binding). I machine stitched it to the back and front using Aurifil 5006, which blends perfectly. The finished quilt top is 36 inches wide by 48 inches long. 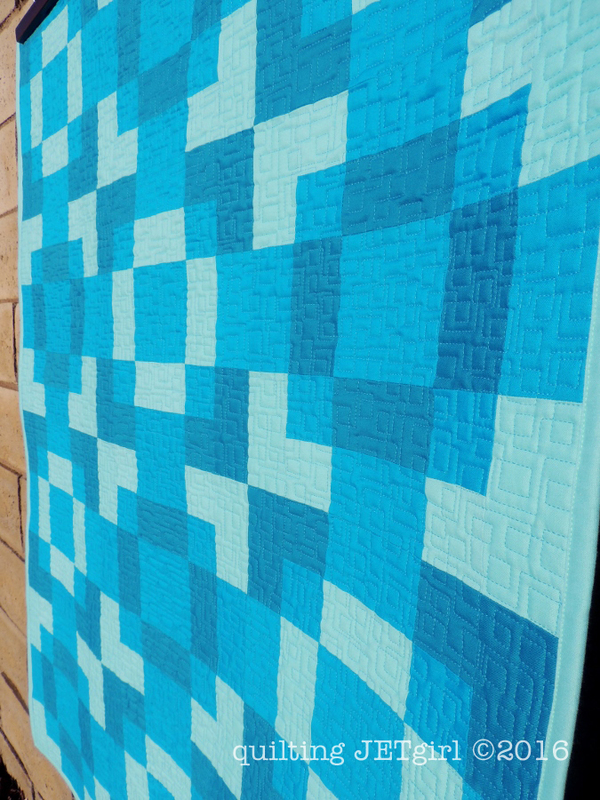 Cut and Shuffle Quilts is available for purchase from AQS and Amazon (not affiliate links). Linking up to Finish it Friday and Can I get a Whoop Whoop. It was great to learn about this book, and I am amazed at all you get accomplished. 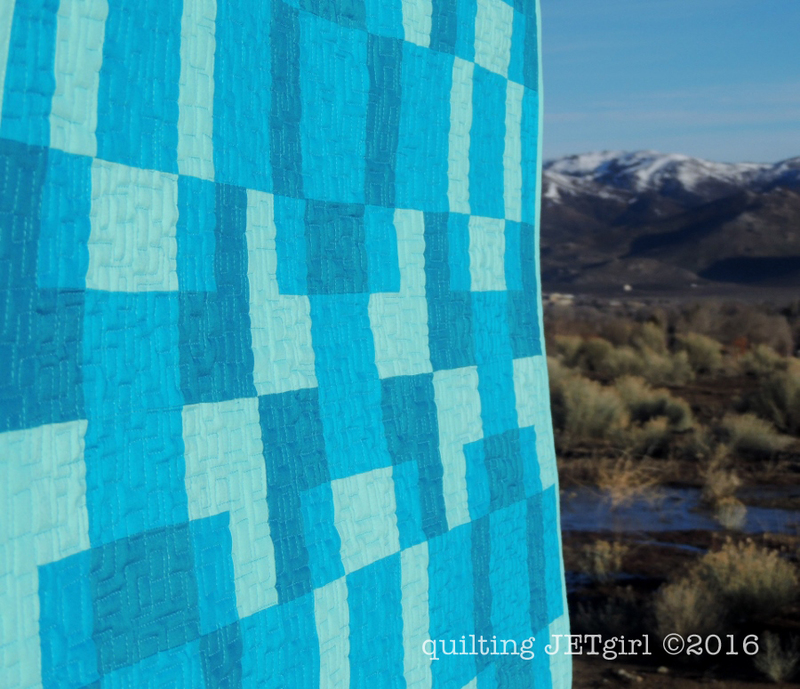 The palette for the quilt featured in this post is so lovely, and the quilting goes perfectly with it. I appreciate continuing to learn from you. Take care, Mary. It’s gorgeous, Yvonne! 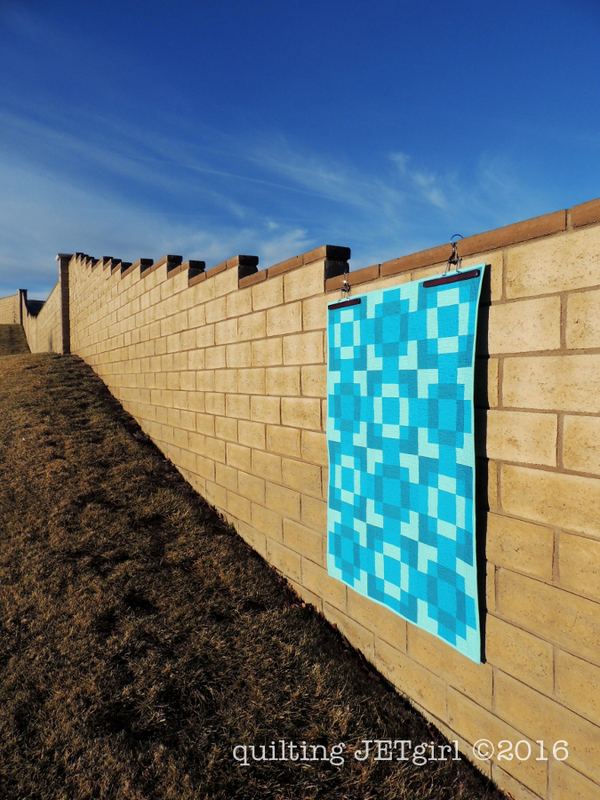 Sounds like a fun and simple way to make a complex-looking quilt. I love the way you played with transparency for this one. Nice job putting your twist on the quilt. I am enjoying your exploration of transparency, and look forward to seeing how you use it in different ways. It is a beautiful quilt! Your colors are spot on! Cut & Shuffle looks difficult and complicated, I’m all for a fun and easy complex design! Wow! Your quilting is fabulous, Yvonne! Nice colors and the backing matches perfectly! It’s a beautiful quilt Yvonne. Thanks for sharing your take on this book. It sounds like a really interesting book to add to the library. Great Job Yvonne! I love using up fabric scraps and when they turn into a beautiful quilt like the one you created it is a double score! This does appear to be a complicated pattern. I will take your word though; I recently discovered the Disappearing 9 Patch and the Disappearing 4 Patch block patterns and thought they looked very complicated, yet they really are not. I am giving the D4P a try using a scrappy play with 6 inch pre-cut squares. Turning out to be a lot of fun. 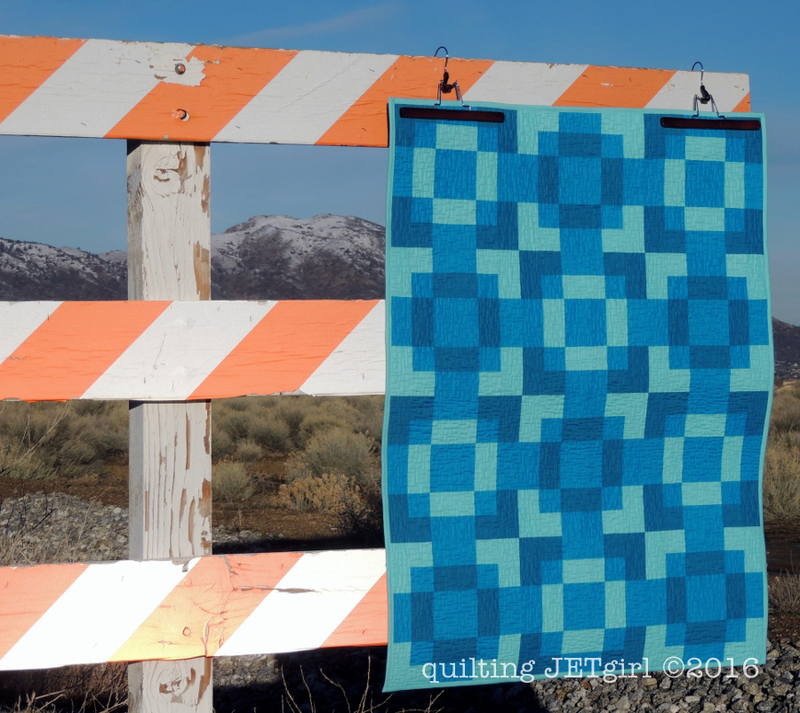 Another aspect of your quilt that is amazing is the quilting pattern that you used! I truly think that this design goes splendidly with your quilt pattern. When I get ready to quilt my D4P , which may be awhile, I plan on coming and just looking around at some of your quilting and see if anything will give me any ideas and work with my beginning FMQ skills; With Your Permission Of Course! Thank You for sharing and have a fantastic creative day! 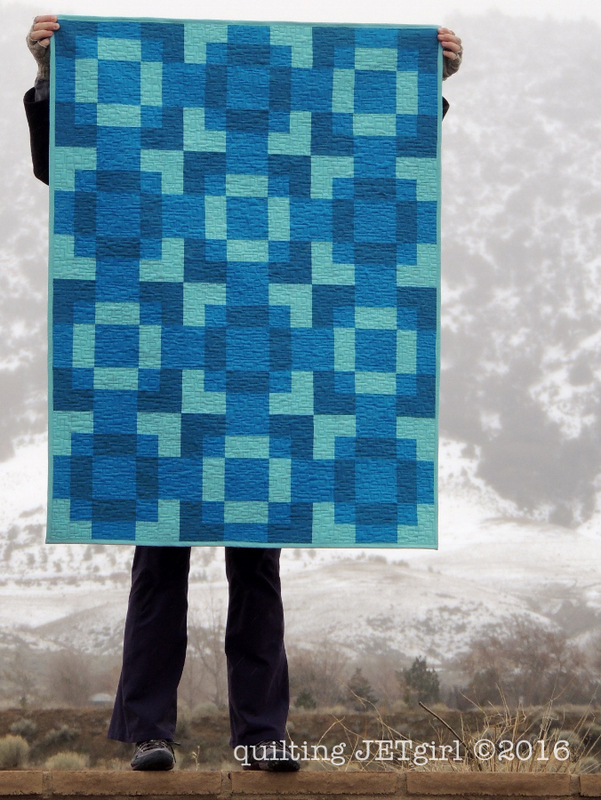 Such a striking quilt! What I really like about it is that it is a great pattern for a more masculine quilt. Definitely looking into this book. Thanks for the review. And by the way, I love the wall you’ve been using for your photo shoots. Love your choice of color too. Very nice quilt. Oooh…what a great quilt. I love the colours and the pattern. This is a neat idea – I like the negative/positive aspect of it. Once again Yvonne, you blew it up! Fantastic choice of fabrics and beautiful quilting. Looks like this one will be added to the list. This sounds like an interesting book, thanks for the review. I like how you used the basic plan to play around with transparency. This looks great, Yvonne! I have had to take a long break from sewing, and I think a Cut and Shuffle quilt will be the perfect leap back into piecing. I’m excited to get started… I loved seeing what you chose to do. So much fun seeing this finished quilt you worked on at the retreat. Your transparency worked out great! I love the boxy quilting as well. Great quilt, I like how you incorporated the transparency thought into the cut and shuffle technique. The backing is perfect! Sounds like an interesting concept for a book, I do love it when blocks can be shuffled around to create a variety of different designs. And yours turned out beautifully, great colours, and must have felt good to be able to get them all from your stash. I love Jan’s book too Yvonne. Your rendition is breathtaking! I love how good you are at making fabrics look transparent. 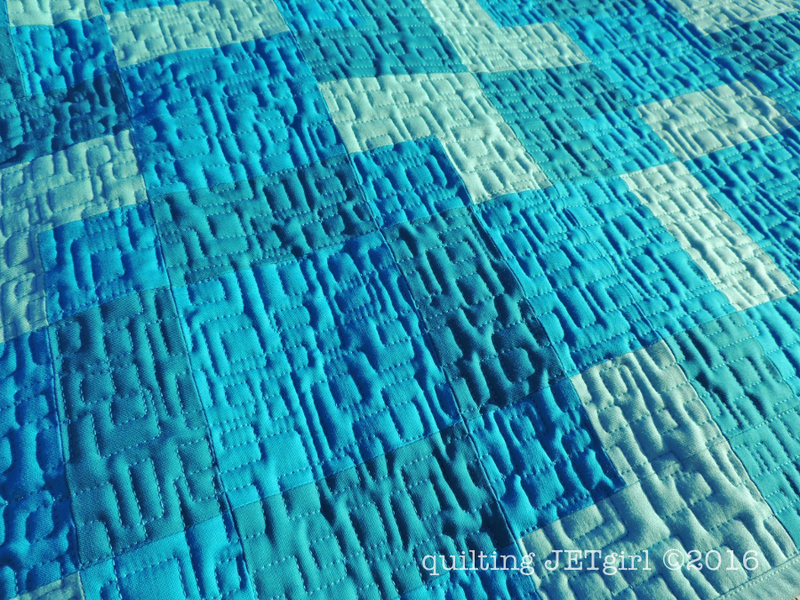 The texture of your quilting looks amazing!! The colors you used are some of my favorites and the pattern looks like a lot of fun. I saw links to your transparency quilt and another I love (can’t remember the name but it was in a Weeks and Ringle book) straightaway. I love the monochrome shaded look. I also think the book’s idea of a block mama is very clever! I love your version as you always do transparency so well. I’ll be looking for this book.